Managed to get a table inside for food, drawn in by the live Jazz on offer. There was one guy on piano, another on Sax, ok but not the best we'd heard. 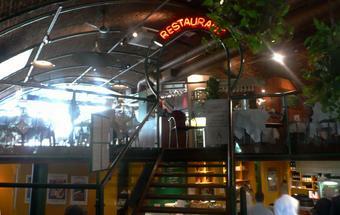 Table was ok (had a booth near the back under the curved ceiling), but food was fairly overpriced. Had the burger - the burger itself was ok, but the bun was a cheap sesame thing which was disappointing. And given the price, the chips definitely weren't homemade. Service was good and the wine was reasonable value for money. Not bad, but won't rush back. Went here on a wet Thursday early evening and it was three quarters full. Very friendly service, we got seated as we wanted food too - chap playing piano added to the atmosphere. Not really a pub - there was no draught bitter when we went but good assortment of bottled beers and a German one on tap. Food was really good - would go back. Yes, me again! Its that time of year, annual report...! (Am i the only person who uses this bar...?)! 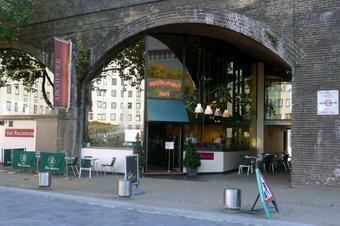 They have done a really good job here of making the space within a couple of railway arches interesting and comfortable. There are multiple levels, with a full service restaurant on the upper level, and snacks available everywhere else. Its very much a bar/restaurant, not a pub, but they do have draught Paulanner at �3-60. a pint. The staff are friendly and the service excellent, all in all a very pleasent place to while away a couple of hours.